Yes, you need to see Iron Man in order to really dig Iron Man 2. That’s because the sequel is a member of a very special brotherhood in Hollywood. One that includes action follow-ups that are better than the originals. Think Aliens, Terminator 2, and The Wrath of Khan. Iron Man 2, welcome to the club. The first one was about Tony Stark (Robert Downey Jr.), billionaire inventor, weapons manufacturer, and ladies man. It told of how one of his experiments went awry and almost killed him, and how another one saved his life. The film was smart and funny and action-packed, and Downey anchored it. The new one is smart and funny and action-packed, and it’s bigger and better and sleeker. And Downey does it again, this time ramping up Stark’s arrogant wisecracking, telling anyone who’ll listen (mostly women) that, via the creation of his powerful Iron Man suit, he’s brought years of uninterrupted peace to the world. Stark is so full of himself, he even gives away the secret that he’s Iron Man, no doubt because he feels he’ll get even more praise. Instead, he gets trouble. The American military wants to know what makes the suit tick. A rival weapons manufacturer (a shining Sam Rockwell) also craves some glory. An angry Russian inventor and maniac (Mickey Rourke) has cause for wanting to exact revenge on Iron Man. 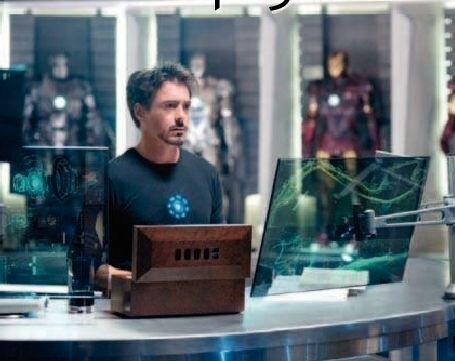 And, uh-oh, the invention that previously saved Stark might now actually be killing him. (Watch out for those rising blood toxicity levels, kids!) Being part of a Marvel Comics franchise, the film must, of course, show off some beautiful women. Gwyneth Paltrow returns as Pepper Potts, Stark’s right-hand gal, who promotion in Directed by Jon Favreau the story (but Starring Robert Downey Jr., still not much Don Cheadle, Scarlett to do in the Johansson, Mickey Rourke, film). Joining Gwyneth Paltrow, Sam Rockwell, her is Scarlett Samuel L. Jackson Johansson as Natalie, about whom all that will be revealed is that she’s slinky, tough and mysterious. She, too, could’ve used more screen time. But much of that is taken up by visiting more international locales than most Bond films. Returning director Jon Favreau — who also plays Stark’s driver — has made sure there’s plenty of room for some AC/DC tunes to accompany his big opening and closing set pieces. Iron Man 2 makes for a spectacular start to the early summer season. Be sure to stick around for the post-credits mini-movie that shows, in no uncertain terms, what’s going to splash across screens exactly a year from now. Hint: It’s not another sequel.